It's no secret that toddlers and preschoolers are often reluctant to perform the most basic of tasks; like washing their hands. Of course, they can often go the opposite way and become a bit compulsive about it all, literally working themselves up into a lather to shoo those germs away. Assuming your children are in the first camp, of well meaning but forgetful, here's an idea that I've found works for us: turn the soap pump into a toy party. A clear plastic soap dispenser - the color of the soap is up to you. Clear works well, pink, blue or green tinted is fun too, but the container must be clear. Strip the push-soap dispenser of all labels and clean the bottle as best you can (there are links to how-to clean bottles on my facebook page if you scroll down to March). Use the soap dispenser for some time to remove some of the soap, or simply tip some of it into one of your other dispensers. Remove the screw-on nozzle-cap and tube, and fill the bottle-dispenser with plastic items. Get the kids to start washing their hands! 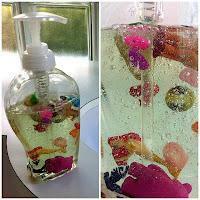 Jungle - use green soap and place long rubber snakes inside the bottle. Princess - use pink soap and large pink and gold beads. Mermaid - use blue soap and fill with tiny plastic fish and pearl bead-bubbles. Lego - use clear soap and lots of small square blocks. Baby Shower - use blue or pink soap and then fill with buttons. Halloween - use green 'goo' and fill it with eyeballs and spiders. I used green soap and an assortment of everything I had on hand to see what worked best; small toys, beads and buttons. So far they all did the job. Some seem to float, then sink, you tip the bottle, they move around, get coated in bubbles, and then shift about again. Endless hours of fascination really! So go on... get crafty and clean at the same time!